I’ll be the first to admit that I’m weirdly obsessed with this new little quilt! I didn’t plan on making it, so maybe that explains some of its appeal, or maybe it’s just that it all came together so nicely… I’m not sure, but I am sure that I’m in love. It all started last week with a little trip to my local fabric shop, nido. It was meant to just be a visit to say hi to Phiona, but of course I can’t resist new fabrics, so this new Nani Iro was quickly added to the cutting table. This time around the Nani Iro is a brushed cotton twill and is so soft, almost flannel-like, that I immediately imagined a blanket for Max. I also picked up a bright gold/yellow shot cotton for the blanket backing. As soon as I returned home the blanket idea was switched to a quilt (of course!) and paired with this wonderful plaid print from Denyse’s latest line for Joann’s. I’ve always been intrigued by whole cloth quilts, though I hadn’t ever made one, so I was kind of excited by the prospect of making one. I’m still kind of stuck on that circle quilting, so I quickly marked up the quilt top and started sewing. I used a yellowy-green variegated Sulky thread, and used my walking foot to slowly quilt these circles. A trip through the washer and dryer and this has become my current favorite quilt. I made it for Max, but I certainly snuggle with it every chance I get! The soft Nani Iro, combined with a great lightweight batting (Quilter’s Dream Request) and that soft lightweight shot cotton is just the perfect combination. And that binding? My new favorite! Now if only it was less baby-sized and more Ashley-sized! Here’s a quick little diagram on how I quilted this quilt. More details provided here. 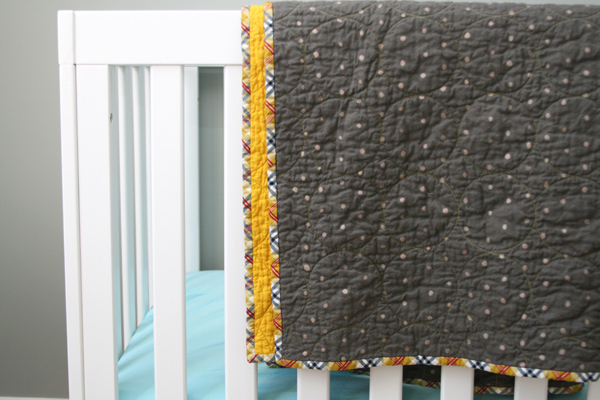 This entry was posted in [search] Other Quilts, baby, Quilts and tagged aunt edna, baby quilt, denyse schmidt, handmade, modern, nani iro, quilt, shot cotton, whole cloth quilt. Bookmark the permalink. what’s on the (design) wall? This is perfect. I can tell by the pictures that the grey is so soft and I want to touch it through my monitor. The binding could not be better. I’ve been wanting to do a wholecloth quilt for a while, and seeing yours makes me want to cross out all current projects and go for it! It can’t be too much of a commitment, can it?- Just on the quilting part. ok I am so lost. I love all the quilts I see here but I have absolutely no idea how to finish them off. I can make a flip and stitch quilt in fact thats all I seem to know how to make. I normally sew the bottom and then sew that lovely blanket satin binding to the end but I want to know how you make what I ws told was a “true” quilt. And what is simple to make and very popular to buy please? ps I hand sew everything I cannot seem to be able to operate a sewing machine…. Your circle quilting is gorgeous. I can’t believe your waking foot does that! I will definitely be experimenting soon…. I love it! This looks like the perfect thing to start playing with quilting on my own. I agree, Melody – perfect thing to begin quilting! Loved that the directional pattern was also show, made so much sense! I think I will try it soon! Wow!! A perfect example of the elegance of simplicity. Your circle quilting is incredible, and such a temptation to try. Add me to the Love-It club! hmmmm. It looks like you moved from one circle to the other without stopping. Brilliant. Must try that . thanks! That’s a super cute quilt! It’s so lovely. I’ve recently been very drawn to whole cloth quilts. So cozy without quite as much work as a patchwork. 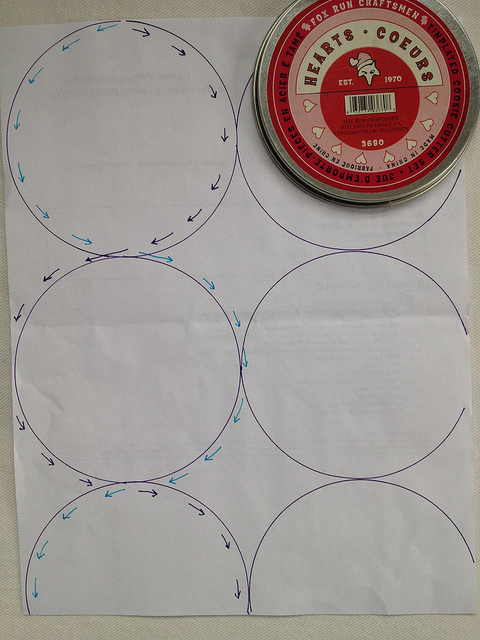 Do you mark your figure 8 quilting pattern or just stitch it free hand? LOVE this quilting! Must try! I love whole cloth quilts ~ this one is just lovely! It does look quite inviting and your quilting and the look of it after washing is wonderful. Beautiful! Would love some tips on getting that result with walking foot. Did you mark the circles first? It does look REALLY cozy. I just made a whole cloth doll quilt for my daughter, and she loves it. I kind of want to cuddle up with that quilt! I’ve been thinking about trying out a whole cloth quilt too, and I’m even more tempted now because yours looks great! The binding makes me want to sew something. All the fabrics are beautiful, but the plaid is perfect! Nice work, you have such a great eye for color and scale. so so awesome ashley! and the colors are great. I just made a whole cloth baby quilt for my friend, it was fun! Those circles are amazing! Oooooh!! I LOVE THIS!!! I’ll have to check my LQS. Fingers crossed that they have it! And thanks for the tip on the circle quilting. I can’t wait to try it! Thanks! It looks so snuggly! I just got a walking foot for the first time, so I am eager to see what I can do with it. I just found your blog and I am so excited to find someone blogging from my home state. Especially since I heard about a new store I haven’t been to yet. Guess I know what I am doing this weekend! Simple and gorgeous. So much impact! Thanks for showing how you quilted the circles. OMIGOSH ashley, i love this quilt so much! the colors are just gorgeous and that plaid binding is perfect! 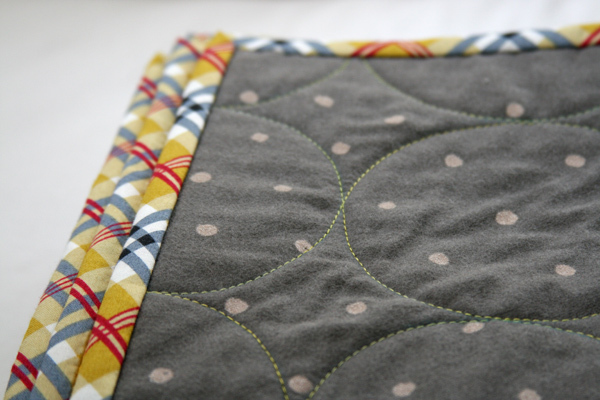 oh and the quilting…i just love it. I love that plaid binding! Absolutely love this!! The colors couldn’t be anymore perfect together! Thanks for sharing your circle quilting. Awesome! I’ve also been intrigued by whole cloth quilts, but never made one. Yours is fantastic! Looks just right for Max too. I’d like to do those circles… I wonder if I could make a throw work in my machine. Love the simple design and how the circle quilting echoes the polka dots. Thanks for the inspiration! It’s so cute! I’m loving the binding and the quilting! I love brushed cotton, it’s super durable. I too have always been interested in whole piece quilts! They are like an empty canvas showing off the fabric and the quilting. love love love !!!! it’s wonderful!! the colors, quilting, awesome! Intrigued, huh? 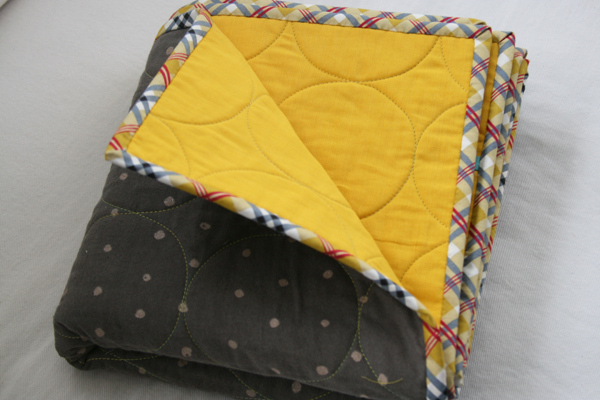 I make “whole-cloth” quilts all the time when I’m too time-pressed or lazy to piece the top! Or sometimes the print is so pretty, who cares? 🙂 It looks great! Love the binding and love the quilting! I love its simplicity and still looks so ‘lovable’- well done! I adore the cirlces and looks simple, but as a learner I feel I should just try straight lines at this moment? Number one- Thank you so much for the info on quilting the circles. I needed that! Number two- I love the binding you used. This is so simple and wonderful. Thank you so much for showing the circle quilting technique, I made a quilt over the summer with hand pick-stitched circles…I liked the result, but your technique would be much more time efficient! I love love love the plaid binding!! 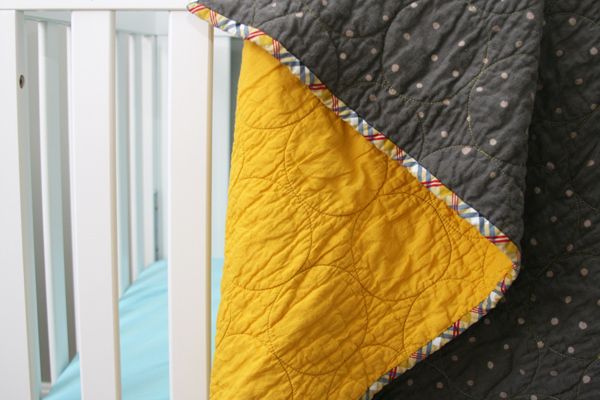 I want to make this and could see my little nephew cuddling with a quilt like this! I know he’d love it! Love the binding. I am also on the hunt for unique baby quilt binding. Gotta SEW love that plaid. Found via pinterest. It’s really gorgeous. I love the subtle nani iro brushed cotton and the shot cotton with cheery binding is a wonderful way to liven it up. 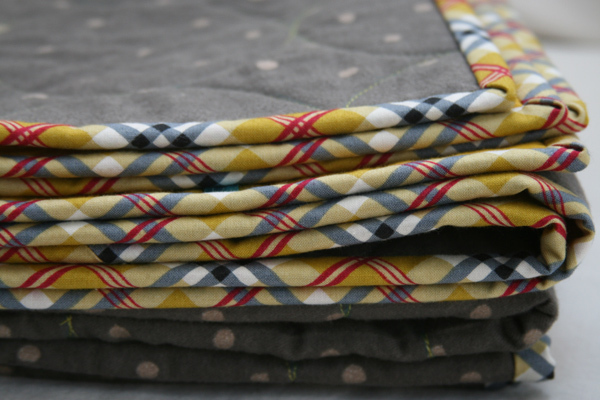 I thought I was in love with polka dot binding until I saw this plaid, it’s beautiful! I love the whole cloth concept and the quilted circles are wonderful. Thanks for the edit that shows how you quilted them. I just bought a walking foot for my Janome and now I seriously need to schedule some time to sit down and try this out. I get so inspired every time I visit your blog, thank you! What a sweet quilt. I love the plaid binding and the quilting is devine. your explanation makes it look so simple. i’ll try it!